Invite guests to hop on and enjoy the ride with our Joyful Journey save the date cards. 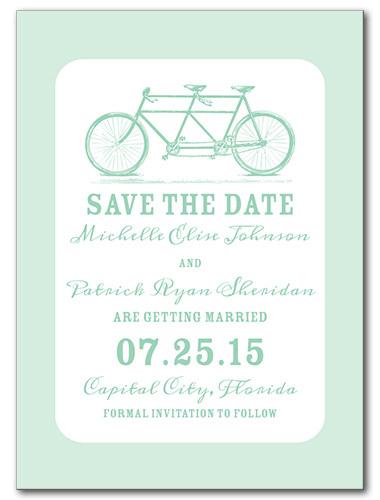 The journey is just beginning with a whimsical two person bicycle displayed at the top, paired with a cool mint green color and eye-catching combination of fonts. You can even choose your own wedding font to customize its design, allowing you to show off your own personality and taste. Get ready for an adventure with this fun but classy card. Joyful Journey For the best experience, we recommend personalizing your stationery on a desktop computer.